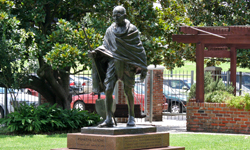 Located in a prominent spot near the International Sculpture Garden and the Houston Garden Center, facing the Martin Luther King, Jr., sculpture across the lawn, Mahatma Gandhi is made of bronze and stands on a polished granite base. It has been part of the City of Houston art collection since 2003. It is the work of Ram V. Sutar. Mahatma Gandhi was born in Porbander, Gujarat, India, on October 2, 1869. Trained in the law in Britain, he served for two decades as legal adviser to an Indian businessman in South Africa. During this time, it became clear to him that Indians had no political rights in the British Empire. He formulated the concept of passive resistance in South Africa, and became a leading force in the Indian population there. When he relocated to India in 1915, he became increasingly influential as a leader in nationalist politics. His non-cooperation movement led to a paralysis of British control in India and, following World War II, the eventual independence of the nation. He is considered by many to be the father of modern India. 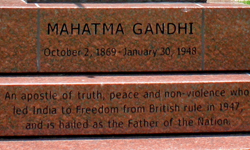 Gandhi was assassinated in January 1948. Ram Vanji Sutar was born in India in 1925, and showed artistic promise from an early age. His Mahatma Gandhi is representative of the many works he has produced through his long career as a sculptor.